With all the MOTHER 2 stuff going on lately, there’s been a lot of other neat stuff that I haven’t had time to post about. Here’s one courtesy of resetsurvivor! So, I was able to get Shigesato Itoi’s Mii from the WiiU! Then I transfered it to my 3DS and made a QR code of him for all of you. It’s official alright. I wouldn’t try to pass off a clone I made. I was super excited when ‘he’ finally showed up in my WaraWara plaza on the WiiU. If you have a 3DS, you can scan in the QR code in this pic and then you’ll have a copy of Itoi’s Mii! I don’t know much about Mii stuff or Wii U/3DS stuff, so I’m not sure what you can do once you have a copy of him. I think you can use him in some sort of RPG game that comes with every 3DS at least. Tomato. I just want to say, this is one of my favorite if not my favoirte website. And I think it’s totally awesome that you update this site almost daily with news and material. I appreciate it. Zoom! Thanks for posting this. I know there has to be people out there who collect Miis too. 🙂 A fun thing to do would be to transfer the Mii from your 3DS to your WiiU and use him in Nintendoland games like Zelda or Metroid .. or watch him get down with the Octopus Dance! Got him, but his name is written in Japanese! At least he could write his name in English, because my 3DS is European. Also, it’s impossible to use him in Mii Plaza. ^ Not all of them have gold pants. Mine dont. It’s his personal Mii from is Wii U. @misterdigi35 Almost Daily Mato News! @Gameplay4fun I’m sure the man himself as an actual pair of gold pants from his gold-mining adventures. @Earthbounder I got a Miyamoto Mii the other day. His pants weren’t gold. @resetsurvivor: You can get him much more easily just through the Wii U. He posts in the Mother 2 developer’s board. @Justin: I just figured people might want the QR. Itoi doesn’t show up much in my WaraWara. I’ve only seen him once since the Mother 2 community never shows up in the WaraWara for non-Japanese consoles. I just scanned this QR code into my Wii U and it worked as well! This is awesome, thanks for sharing resetsurvivor! Aren’t special Mii’s suppose to have gold pants? Or is this just Itoi’s own personal one? I also got Miyamoto on my 3DS and in fact he does have gold pants like most other special miis. 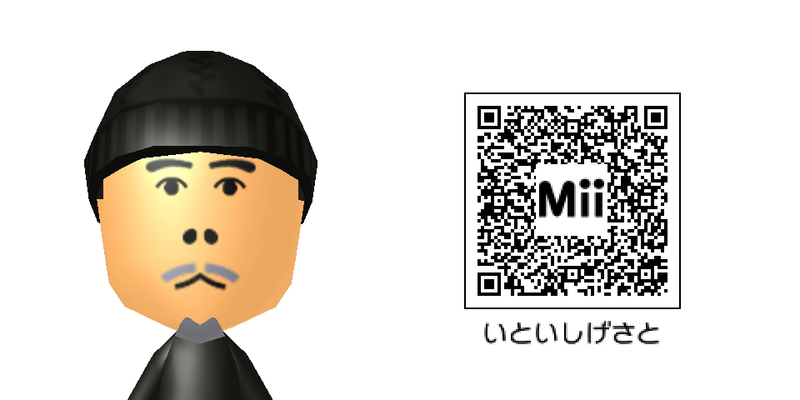 Not sure why yours doesn’t but I copied him to Mii Maker. I just got Itoi blue Pants.